Last updatit on: 14 August 2016. 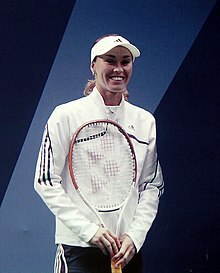 Martina Hingis (born 30 September 1980) is a Swiss professional tennis player who spent a tot o 209 weeks as warld no. 1. ↑ "Press Center – Weeks at No.1". WTA Tour. Retrieved 11 July 2011. This page wis last eeditit on 12 September 2016, at 16:27.